1Consultant Hematopathologist, Hematology Section of Medical Laboratory Department, Qatif Central Hospital, Saudi Arabia. 2Consultant Hematologist, Department of Internal Medicine, Qatif Central Hospital, Saudi Arabia. Received: June 5, 2016; Revised: September 27, 2016; Accepted: November 18, 2016; Published online: June 22, 2017. TO THE EDITOR: Hairy cell leukemia (HCL) is a rare B-cell neoplasm of middle age. Pancytopenia, particularly monocytopenia, splenomegaly, and hairy cells in the bone marrow represent the classical triad of HCL . Splenomegaly accounts for 80–90% of associated features in HCL . The bone marrow aspirations of HCL patients frequently show dry tap due to marrow fibrosis induced by hairy cell . However, careful examination of diluted cytology preparations is useful because of the characteristic morphology of the hairy cells . The exact prevalence of atypical presentation of HCL is difficult to be determined because most cases were published as incidental reports. Herein, we present an atypical case of HCL with only arthralgia but no typical symptoms such as splenomegaly and bone marrow fibrosis. This report of an atypical presentation of such a rare disease could lead to earlier recognition and diagnosis of HCL, even without a classical clinical presentation. A 43-year-old Saudi woman was incidentally found to have leukopenia for 3 months. She had a history of arthralgia, but neither other significant complaints nor remarkable findings on physical examination. The initial complete blood count revealed a hemoglobin concentration of 10.6 g/dL, white blood cell count of 1.95×109/L, platelet count of 110×109/L, absolute neutrophil count of 0.82×109/L, monocyte count of 0.02×109/L, and lymphocyte count of 1.07×109/L. On peripheral blood smear, a few atypical cells with oval nuclei and hairy circumferential cytoplasmic projections were observed. 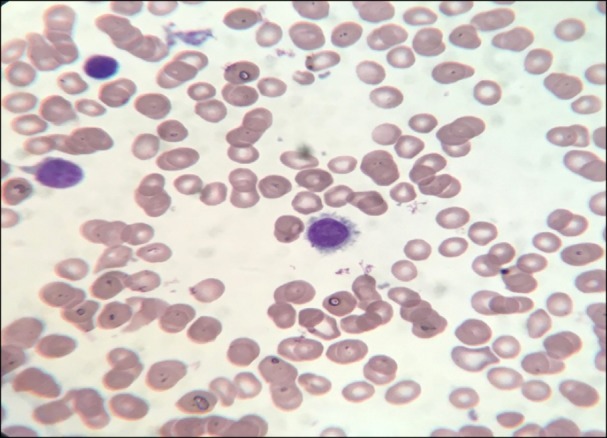 On bone marrow aspiration, there were many abnormal medium-sized lymphoid cells with oval nuclei, homogenous, ground glass chromatin, inconspicuous nucleoli, and abundant cytoplasm with hairy projections similar to those observed in the peripheral blood smear (Fig. 1). Trephine biopsy revealed the typical fried egg appearance of hairy cells with no increased fibrosis. Immunophenotyping revealed the population expressing CD19, CD20, CD22, CD25, CD103, CD11c, FMC7 and HLA-DR (Fig. 2) with kappa chain restriction. The patient was diagnosed with HCL and referred to a tertiary care hospital for further evaluation prior to administration of purine analogue and cladribine chemotherapy. Arthralgia can occur at any time during the course of the disease, unrelated to the tumor burden . Most HCL cases, without splenomegaly, are associated with a hypocellular marrow . The absence of both splenomegaly and marrow fibrosis suggested that this patient may be in the early phase of the disease. Since arthralgia can present during any phase of HCL, this finding did not oppose this suggestion. It is important to distinguish HCL, requiring different therapeutic protocols, from other chronic B-cell neoplasms with circulating villous cells such as splenic marginal zone lymphoma (SMZL) or HCL variant (HCL-V) . In immunophenotypic assay, HCL-V cells are negative for CD25 and ANNEXIN 1, and SMZL cells are negative for CD25, CD103, and CD11c . Like this, confirming immunophenotypic characteristics is helpful in differential diagnosis and selecting therapeutic options . Especially, the BRAF V600E mutation, recently identified as a characteristic biomarker of HCL, could be incorporated on a routine diagnostic work-up of HCL in the near future . Although these sophisticated diagnostic methods are available, this case report highlights the importance of basic morphological examination for diagnosis of atypical HCL. Hairy cells in bone marrow aspiration (Grunwald-Giemsa stain ×1,000). Flow cytometry analysis of hairy cells (CD103+/CD11c+/CD25+). Jones, G, Parry-Jones, N, Wilkins, B, Else, M, Catovsky, D, British Committee for Standards in Haematology. Revised guidelines for the diagnosis and management of hairy cell leukaemia and hairy cell leukaemia variant. Br J Haematol, 2012;156;186-195. Quest, GR, Johnston, JB. Clinical features and diagnosis of hairy cell leukemia. Best Pract Res Clin Haematol, 2015;28;180-192. Venkatesan, S, Purohit, A, Aggarwal, M, et al. Unusual presentation of hairy cell leukemia: a case series of four clinically unsuspected cases. Indian J Hematol Blood Transfus, 2014;30;413-417. Bethel, KJ, Sharpe, RW. Pathology of hairy-cell leukaemia. Best Pract Res Clin Haematol, 2003;16;15-31. Del Giudice, I, Matutes, E, Morilla, R, et al. The diagnostic value of CD123 in B-cell disorders with hairy or villous lymphocytes. Haematologica, 2004;89;303-308. Bamanikar, S, Kumar, H, Verma, A, Buch, A. Hairy cell leukemia: a case report. JMS, 2012;2;200-203. Grever, MR. How I treat hairy cell leukemia. Blood, 2010;115;21-28. Robak, T, Matutes, E, Catovsky, D, Zinzani, PL, Buske, C, ESMO Guidelines Committee. Hairy cell leukaemia: ESMO Clinical Practice Guidelines for diagnosis, treatment and follow-up. Ann Oncol, 2015;26;v100-v107.